An absolutely lovely day to-day - 64 miles and, for the first time, billed as 'moderate' instead of 'hard'. We have reached Wales and turned a significant corner as we are now heading North instead of East. 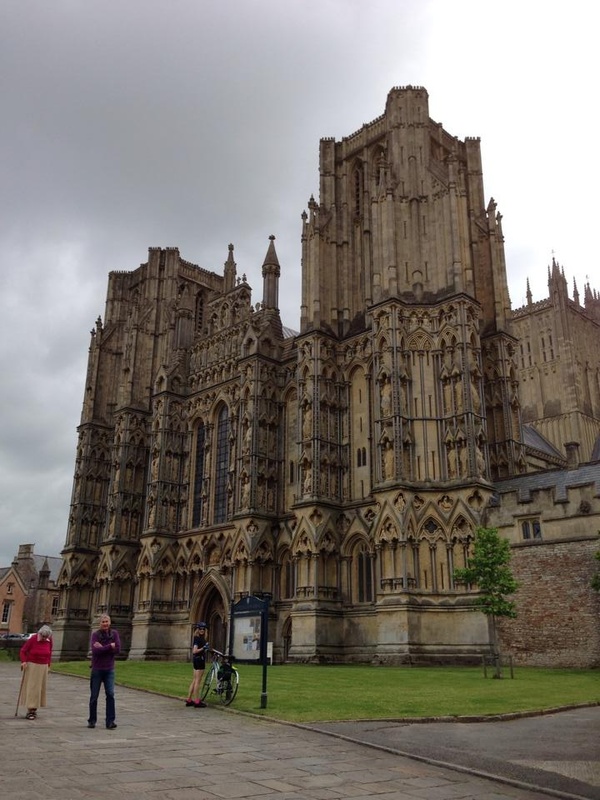 A few flat miles after leaving Glastonbury this morning we found ourselves in a busy marketplace just outside Wells Cathedral. There followed the statutory monster climb, a brew stop at Chew Valley Lake and then the real excitement of the day began. Cycling over Clifton Suspension Bridge and the Severn Bridge, and neither disappointed - both magnificent structures offering wonderful views. This afternoon we experienced what must be a dream scenario for most cyclists - a descent without the ascent! After a tea stop opposite Chepstow Racecourse we swooped down a three mile series of bends to a final reveal of the ruins of Tintern Abbey. We stopped for a cream tea before heading for the night's destination of Monmouth - the road taking us along the beautiful Wye valley with its strangely brown river. Onwards and inevitably upwards in spite of complaining quad muscles.